This pipe seems to have doubts about going underground near Corvallis and Suver Roads in Polk County..
— The Mid-Valley Feeder is costing an estimated $47 million and is taking three years to build. The 31-mile project started in January 2012 and will continue through 2015. 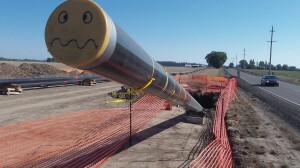 It will pipe gas from the company’s Central Coast Feeder to Dallas, Monmouth, Independence and Albany. As part of the work, the company is replacing 12 miles of pipe along Corvallis Road and Independence Highway. — The other big project is the 10-mile, $17 million, three-year Corvallis Loop Project, scheduled to be finished by Thanksgiving this year. It runs from Riverside Drive south to Highway 34 and from there to Corvallis and Philomath. In both projects, contractors are using a combination of open trenches and horizontal drilling to place the 12-inch-diameter pipeline underground. The company says the installations will bring more reliability to mid-valley service and meet growing demand in Corvallis and Philomath.